Again, unless you feel comfortable with your Korean and don’t want to offend anyone, this is what you should use. With that said, most Koreans won’t expect foreigners to understand this kind of concept but you will most likely fail to make a good impression if you speak to them in ‘lower’ form, like you would to your friends. 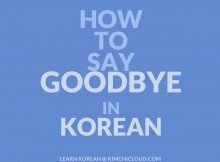 So how would you say ‘I’m happy’ to your close Korean friends? Now let’s imagine your significant other (who is Korean) invited you over to meet his or her parents and for some reason, you want to tell them you are happy. Would you use use the first or the second expression? It should be obvious, but since you don’t know them, you they are older than you and not to mention, they are your girlfriend’s or boyfriend’s parents, you would use the first expression. 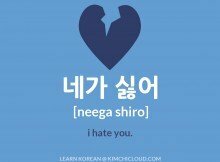 There is however another expression you can use to say happy in Korean. It has a somewhat different nuance to it but before we go into more details, let’s first find out what the word is. The same rules apply here. 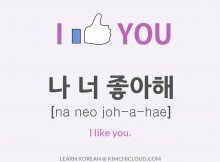 ‘yo’ (요) at the end makes it polite and if you remove it and just say ‘ki-ppeo’ (기뻐). 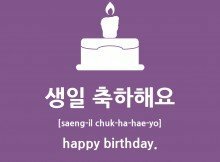 So how exactly is this different from ‘haeng-bok-hae-yo’ (행복해요)? Usually ‘haeng-bok-hae-yo’ (행복해요) means that you are happy just not for the moment (it can also mean that you are happy for the moment as well), but in general over a longer period of time. So with that said, ‘ki-ppeo-yo’ (기뻐요) has the nuance of being ‘glad’ or ‘delighted’ for the moment. The dictionary form of this word is ‘ki-ppeu-da’ (기쁘다). What about Happy New Year or Happy Birthday, etc? In these cases, you don’t use any of the words we learned above. You can’t translate them directly from English to Korea since they are fixed expressions. Luckily, we have made lessons on both how to say Happy New Year and Happy Birthday in Korean. 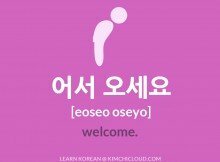 This is pretty much all you need to know about how to say happy in Korean. For more lessons like this, please check out our Everyday Korean Archive. If you found this lesson helpful, please like or share, and if you have any questions, make sure to let us know in the comments below and we will do our best to help you out. Copyright © 2019 Kimchi Cloud.